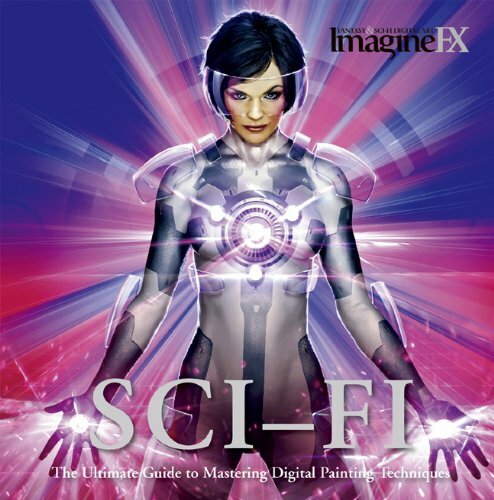 Sci-Fi is the 4th book from ImagineFX on digital painting techniques. Previously, they have covered Fantasy Creatures, Manga and digital painting in general. The tutorials from this book are those featured in the past issues of the magazine. They are in the form of demonstrations where the artists share their techniques and process to creating their artwork. There are 26 tutorials and a short artist gallery. The tutorials are step-by-step with examples and commentary. In some tutorials, you need to know Photoshop to know the terms they refer to. The subjects are quite diverse and covers a bit on the different aspects of Sci-Fi, such as alien creatures, characters, environments, robots, etc. There are also tutorials on 3D modeling, but those are quite elementary. It's a book good for beginner to intermediate artists who want to learn about creating certain effects and get tips on conceptualizing basic sci-fi paintings.